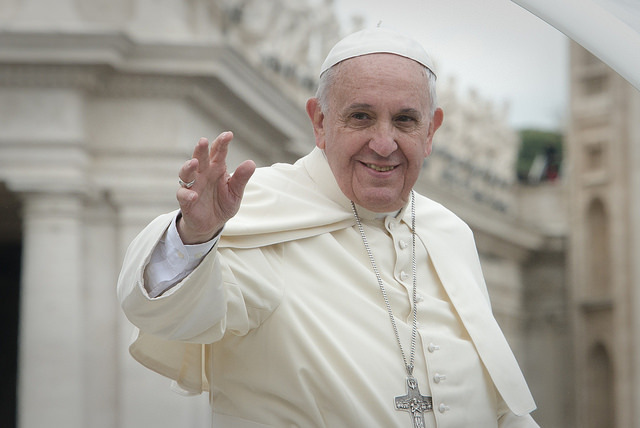 On August 31, Pope Francis issued an apostolic letter motu proprio (of his own accord) instituting the Dicastery for Promoting Integral Human Development. The new Roman Curia department will take effect January 1, 2017 and replace four Pontifical Councils dedicated to charity and human development. Cardinal Peter Turkson, current President of the Pontifical Council for Justice and Peace, will head the new dicastery. According to a bulletin from the Holy See Press Office, the Dicastery for Promoting Integral Human Development will be especially “competent in issues regarding migrants, those in need, the sick, the excluded and marginalized, the imprisoned and the unemployed, as well as victims of armed conflict, natural disasters, and all forms of slavery and torture,”. I was dismayed to see headlines popping up immediately after the apostolic letter’s release inaccurately suggesting that it’s main focus was the care of migrants and refugees. Yes, that is a concern. And it’s also a hot-button political issue that some outlets like to hijack to increase readership. But, it’s not the central issue of the apostolic letter. The new dicastery will see to the care of other groups as well. For that reason, I want to bring it to your attention and to allow you to read the complete letter for yourself. Below is the full text of the Holy Father’s apostolic letter, initially published in the Osservatore Romano. Apostolic Letter, Catholic Church, Pope Francis. Bookmark.